Affordable Auckland housing, controls on genetic modification, and a focus on regional economic development. That could read as the three top lines of a Labour-Greens-New Zealand First government priority list. But it currently represents how National and the Maori Party are positioning themselves to be coalition partners again after the 23 September election. This column covers two angles along one theme. The first is how National and the Maori Party are looking to keep Winston Peters out of government. The second is how the Labour Maori caucus’ decision not to stand on their party’s list could see one of its strongest MPs left out in the cold as he watches Hone Harawira take his seat at a Labour-led Cabinet table. 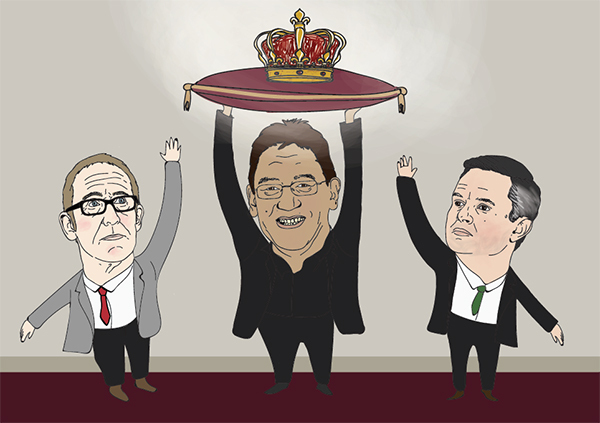 Last Sunday we looked at how NZF’s Winston Peters looks set to be Kingmaker after 23 September. But another scenario should be kept in mind. The now familiar looking National-Maori-ACT-United Future coalition. Bill English’s get out of (Winston) jail free card could depend on how well the Maori Party can utilise its agreement with Hone Harawira’s Mana Party to try and trump Labour in the Maori seats. The flip-side is that Labour’s chances of leading a government could rest on the performance of its Maori caucus. National has made no secret of its cosying up to the Maori Party ahead of the election. While ACT has its three strikes, the Maori Party has three wins. The Resource Management Act was passed with support from the Maori Party after compromises were made by National on genetic modification and Iwi consultation proposals. Another piece of legislation that will be passed before the current Parliamentary term is out is the Te Ture Whenua Maori Bill. This will be touted as a huge win for the Maori Party on regional economic development. And there for all to see this week was a patsy question from Marama Fox to Nick Smith during Parliament’s Question Time, on the Point England Development legislation. Being able to attack Labour for its U-turn on the development, while accusing them of favouring grazing cattle over developing affordable housing was a chance the National/Maori brains trust was not going to miss. Three wins. No doubt there will be more over the next few months. Labour has ripped into the relationship between National and the Maori Party – for the most recent example see Meka Whaitiri's General Debate speech on Wednesday. And for those who missed it, Labour’s current Maori MPs laid down a challenge to the Maori Party last month by saying they had requested to be left off the party’s election list (watch the press conference in the video above). Their only way back into Parliament will be via the Maori seats. If they lose, they’re out. Some of Labour’s most experienced (current) Maori representatives may be gone. Their move was in response to the Maori Party’s agreement with Mana designed to allow Harawira to be elected in Te Tai Tokerau, while giving Maori Party MPs a free run at the other six Maori seats. It also followed the Maori King’s endorsement of the Maori Party – a call that could have a huge impact for its party vote. Now, I’m going to put my neck out there by relying on some polling numbers. And I’m going to run some scenarios that may never come to pass because a butterfly in India flapped its wings. Interest.co.nz runs the Curia poll of public polls on our site, so I’m going to use these figures. I’m going to assume David Seymour and Peter Dunne are returned in Epsom and Ohariu. I’m going to assume they would agree again to a coalition with National and the Maori Party. National/Maori/ACT/UF would have 61 seats of a 122-seat Parliament. Labour/Greens/NZF would have the other 61. But changes are afoot. The Maori/Mana alliance is designed to allow Hone Harawira a shot at beating Labour’s Kelvin Davis in Te Tai Tokerau. It is also set to give most of Labour’s other Maori MPs a run for their money in the other six seats. Based on the combined Maori/Mana votes in 2014, the two extra seats the Maori Party has a chance in are Te Tai Hauauru and Tamaki Makaurau. Labour would have the same number of seats in Parliament based on its party vote. So would the Maori Party. We’re still tied at 61-all. I’m sure English and the Maori Party would love that. But based on current numbers it doesn’t look like it’s going to happen. National/Maori/ACT/UF again would hold 61 seats. But this time it would be in a 123-seat Parliament. A Labour/Greens/NZF/Mana coalition could hold power. They would get an extra seat from Harawira winning while holding their overall number of seats as Davis is replaced by a list MP due to Labour’s party vote. It sounds odd, but the Maori Party’s agreement with Mana could work against National’s chance of forming a government without Peters after the election. It would give Andrew Little a sniff at forming a government. The cost would be Labour losing one of its strongest MPs. * For the National/Labour electorate seat wins, I have divided the remaining seats not allocated to NZF, ACT and UF as 60/40 between the two major parties as this is their respective share of their combined vote. I’ve given Northland to NZF, Epsom to ACT and Ohariu to UF. Sounds like an episode of Air Crash Disaster. This is bold , because National essentially govern alone, and yet accomplished almost nothing. National have accomplished one thing quite remarkable: they've completely devastated the home ownership chances of generations of young Kiwis growing up in Auckland. Some would say it will take a decade furtehr to recover that position, but I agree with your sentiment that its all the Govts fault, Govts and central bankers should not have acted in 2008-16, they should have let a multitude of home owners lose their homes, and their jobs with it as businesses fell over due to the high interest rates. I agree. The young should really be the ones to bear the burden. The bailout of those banks that failed, is subsidized risk. So the bank can't lose. In real capitalism those banks, would have failed, and the shareholders, and bankers would have lost there fortunes. This would have served as a deterrent to future banks wanting to over-leverage the way they did. The fact that 'all time ever historic low' interest rates haven't caused any inflation yet simply goes to show. That the stimulus didn't work, but rather the economy is now responding in spite of central bank policies. Banks ...like your average mid-morning caller to Leighton Smith: Capitalist on tax day, socialist on pension day. So I note that none of that argues that the NZ government has not devastated the home ownership chances of generations of NZers. But, why look at only a small subset of policy? Past governments worked hard to make home ownership a reality in NZ, and boomers got the benefit of those policies from preceding governments. This government unfortunately has done nothing to address crazy demand side factors - preferring only policies that enhance the investments of those born at the right time - and precious little to improve supply side factors. And for example, both quantitative easy and measures to discourage investment in NZ housing could have been implemented concurrently, couldn't they? They're by no means mutually exclusive. At least we're in agreement that the government has indeed devastated the home ownership chances of generations of Kiwis. What an accomplishment! RickStrauss what about this news article today in Stuff? >" a deposit on a $260,000 former state home in Awapuni." Sure. Did I need to mention Auckland, with Wellington rising fast? Or is the suggestion for young Kiwis who grew up in Auckland to cede Auckland to global investors and move out and find somewhere else to live? "It may have been their's but it's not any longer"? Blind speculation. Nobody knows how it will play out. What we do know is that kiwis are getting more and more angry about out of control immigration and housing costs. Can National see the writing on the wall? And Labour have now come out with a policy to cut immigration. If the electorate swallows their pitch on fiscal responsibility, it may take only a few of these secondary issues to tip the balance their way. I think I will vote for them. I am thinking the same thing, never voted for them before. I have been hugely disappointed by National. Me too, though still undecided. If you'd told me ten years ago (as a National supporter) that I'd consider voting for Labour I'd have chuckled and shaken my head. But National have just done too bad a job with regard to the young and upcoming generations of Kiwis. Deputy Labour leader and Mt Albert MP Jacinda Ardern said no-one could deny the role immigration has played for New Zealand's economy and diversity, but it was time for a discussion about whether Auckland could offer the "kiwi life" to new migrants. With 120 MP's in parliament do none of them ever spend time in their electorates, at their electoral offices, talking to their constituents? When you see Nicky Kaye lambasting Jacinda Ardern for letting down the young generations on the biggest issue facing them (superannuation, apparently), you really have to wonder, don't you? Where was Nicky Kaye when her National leaders spent the last nine years denying any housing crisis exists, the real biggest issue facing young Kiwis? Only noticeable by her complete absence. apart from housing immigration will be the second big issue and we now have a clear choice between two sides. my preferences I want a yearly figure set, which is filled by returning kiwis first then the most wanted, once full wait for the next year, my figure 25K with a 10% buffer. to be set at election date for three years or until next election. So you want to limit immigration to 25'000 pa ? They are probably all working as taxi drivers. They certainly are not working on infrastructure because the government has zipped the purse strings shut as it worked on more pressing image needs, such as generating a government surplus. Well having been down in Christchurch a few weeks ago, every building site seemed to be crawling with Filipinos for a start. And from what I understand from talking to guys in the construction industry, there would be considerably less construction going on if they weren't able to import workers for these projects. So I dare say there will be very few Christchurch people that will be happy to wait years longer for sufficient locals to undertake the recovery, just to satisfy those worried about clean water and ground pollution. The same will apply to Auckland and to say that there isn't large numbers of immigrants working in construction is either a case of walking around with your eyes closed, or a political agenda. How can it be that we are unable to build homes, roads, waste water systems and so on without imported workers? Why are we being fed this line that seems to vary between lack of skills and lack of basic workers (fruit pickers for example) depending on the circumstances. Computerisation and mechanisation are freeing up people all the time, we have a massive services sector that's mostly fluff, we've stopped making most things here (clothing, footwear, manufactured goods generally) and there's a not so small army of folk sitting around doing little or nothing. What sort of an outfit have we become that this sort of nonsense is considered OK. Sigh. The joys of MMP. Nearly, but not quite, as gridlocked as the US non-system. Trouble is a weak government can't make changes in a timely manner. National are only now able to make changes to the RMA, it took them 8 years. It will take 3 years after they are put in place to figure out if they are useful or not. Under first past the post, each government could actually act, and the next government could sort out which of their actions had worked. I thought MMP would be an improvement, but instead it has given us stagnation. I think National have done ok, not great, but ok. They just repeated Helen and Michael's immigration, housing and banking policy, with the same result. Look, I like MMP, but it favours discussion and consensus over action. First past the post lends itself to action, whether the other parties like it or not. So new things get tried out. Those that fail get discarded and those that work get kept. It's more experimental rather than theoretical. Quite so, although you will tend to get fewer small parties with FPP and miss out on some alternative thinking and input; the Greens strong environmental position for example. By way of example; I am very concerned with the state of our inshore fisheries and the effect of depletion on marine mammals, seabirds and the marine ecosystem in general. From media releases and my own correspondence with MPI and the minister (Nathan Guy) it appears the current lot couldn't care less. Their recent comments concerning the highly endangered Hectors Dolphin are typical but the destruction and collapse of numerous species needs to be more widely known. It would appear that the collusion between the big fisheries players and the Ministry of Primary Industries (AKA The Ministry of Extinction) is complete. That's why we need the likes of the Greens to hold these dodgy buggers to account, I fully believe they won't stop until it's too late otherwise. FPP also lends itself to gerrymandering and in "safe" seats other parties not being prepared to put up strong candidates guaranteed to lose, thus pretty much giving those voters zero choice. Thanks but no thanks, we wanted rid of FPP and we got rid. National are only now able to make changes to the RMA, it took them 8 years. In other words, this is their third go in a series of goes. Every one of them creating more work, more complexity and more changes that councils and their planners have to implement to a piece of legislation past its use by date. National don't have the intellectual grunt to implement real legislative reform. They are tweekers - and in most cases it seems, tweekers without a clue. ... same old , same old , in Godzone .... .... SIGH ! Little wont be the Labour leader come election time. Just look at his court case. He is in it up to his nose, it just depends how bad the damages will be. It's no coincidence that a few weeks before the case Labour dump Annette and moved Jacinda to No 2. Then placed Ardern in Mt Albert rather than Little. Little will step down after losing the case, Labour will move Ardern to Leader and bring in a new No 2. How that pans out come election day will be interesting - Personally I think Ardern is a waste of space. She is everything a "Pale, stale, male" represents - No experience, no real accomplishments, and no leadership. Yes Little does look like a lame duck leader however to replace him they will need to run the "Labours Got Talent" contest. I'm not sure they will have time between now and Sept and will the unions vote for Ardern? Do what Kuwait does with migration. One person out, one person in. 0 migration!!!!!!!!!!!!!!! Not sure we should treat our migrant labour like Kuwait does, though. Very smart they are in Kuwait. Got a population target. Work to it.